Selecting the right storage unit can be extremely important when it comes to the items that you’re planning on storing. Whether you’re just looking for somewhere to keep a few things while you move or a more long-term option to keep your valuables safe, you want to make sure that your belongings are kept in pristine condition. Storage units vary when it comes to shape, size, and level of customization. Some units allow owners to control the temperature, where other units are completely climate controlled — but what’s the difference? If you’re debating whether to rent a climate or temperature controlled unit, take a look at this guide to figure out what the difference is between the two and which unit is the right option for you. What is temperature controlled storage? Temperature controlled units are storage units where the temperature of the unit can be controlled by the owner. Akin to an air-conditioned room, you can alter the temperature of the room to be hotter or cooler as per your requirements. The temperature fluctuation allowed generally isn’t extreme in its range and does not protect against humidity. Climate controlled units are storage units where you can regulate the entire climate of the storage unit, including the humidity. 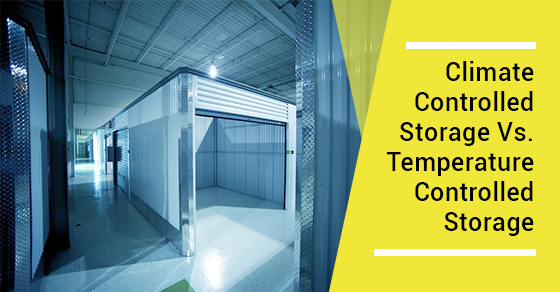 Every degree counts in these storage units and you can practically create a tropical rainforest-like atmosphere in Canada when using these facilities. If you’re dealing with wood, fabric, or something even more delicate like artwork, humidity is of the utmost importance. Mold and mildew can ruin items – a situation that can be prevented if you opt for a climate-controlled unit. There are numerous factors you must consider when using climate-controlled units. For example, artwork is best stored at 60–70 degrees Fahrenheit with 50 percent relative humidity. Otherwise, fine art may expand or shrink, or can even grow mold. When storing temperamental materials, you should find out the specific storage requirements to ensure they remain in good condition. What’s the Difference between Climate Controlled and Temperature Controlled Storage Units? While being able to control the humidity is the main differentiator, there are some other differences between climate controlled and temperature controlled units that you should note. Climate controlled storage units are usually housed inside a much larger building. They may even have a number of floors to traverse through, which is why you often hear of terms like ‘ground level access’ or ‘upper-level access’ when considering a climate controlled unit. On the other hand, temperature controlled storage units may be built outside as a ‘drive- up storage unit.’ In fact, sometimes garage-like non-climate control storage units are converted to temperature controlled units. They’re usually smaller than the climate-controlled ones and can be accessed by a single key. Climate controlled units are considerably pricier than temperature controlled units, generally ranging from 15 to 20 percent more than the latter. Therefore, it’s impractical to go ahead and invest in it if your range of goods does not include items that might become ruined due to humid conditions, or lack thereof. Since you can manage both temperature and humidity in climate controlled units, these two factors co-exist to achieve the perfect atmosphere. As the humidity decreases, so does the temperature as the air starts losing heat. Climate controlled units use HVAC systems along with other tools like thermostats and heavy-duty insulation to maintain optimal climates. The use of dehumidifiers instead of air conditioning units make all the difference; they’re the best at getting the job done without making the atmosphere too cold, and they’re energy efficient. To choose the best place for your goods, make a list of things you want to store, note how many of them are likely to get spoiled in humid situations, and then make a decision. Electronic gadgets may only need temperature control, but if you’re storing them for a long period of time, they may grow mold. As such, the duration of your storage also plays an important role in deciding what kind of facility you should opt for.